PLEASE NOTE: DRC STAFF WILL HAVE LIMITED HOURS ON JANUARY 10th AND 11th, 2019. To contact the receptionist for deliveries, to change an appointment, or get directions call: (206) 443-9603, Ext. 113. For help with a dispute call: (206) 443-9603 and press menu item #1. The Dispute Resolution Center is located on the 5th floor of the Good Shepherd Center in the Wallingford neighborhood of Seattle. 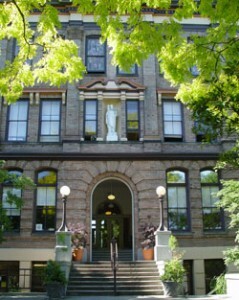 The 100-year-old historic building is adjacent to Meridian Park and surrounded by 11 acres of beautiful park land. The DRC is close to I-5, route 99 and several bus lines. Visitors and clients enter through the main building entrance on Sunnyside Ave N and may use the stairs or the elevator to get to Suite 520. Get on I-5 South and take NE 50th St. Exit. At end of exit, turn RIGHT onto NE 50th St. Turn LEFT on Sunnyside Ave N which will be the second light from the Exit at the top of the hill. The Good Shepherd center will be on your right. Turn right into the second driveway and follow the drive left to the parking lot south of the building. Enter the building at the main entrance. Get on I-5 North and take NE 50th St. Exit. At the end of the exit, turn LEFT onto NE 50th St. Turn LEFT on Sunnyside Ave N which will be the third light from the Exit. The Good Shepherd Center will be on your right. Turn right into the second driveway and follow the drive left to the parking lot south of the building. Enter the building at the main entrance. Take 46th Street Exit and follow it east as it becomes 45th Street. Turn left at Sunnyside Ave N and go a block and a half, then turn left into the Good Shepherd Center just before Sunnyside intersects with NE 50th St. Follow entry drive to the left and into the parking lot south of the building. Enter the building at the main entrance. From east/west, Metro bus route #44 stops 2 blocks south of the Good Shepherd Center at 45th Ave and Sunnyside Ave N. For north/south travel, route #16 stops on the west side of the Good Shepherd Center on Meridian. For connections and exact times, Metro assistance is available by calling 206-553-3000 or visit www.transit.metrokc.gov. There is a parking lot on the south side of the building that is free to the public. There is also plenty of street parking around the block.